Join us on Tuesday 19th April from 11.00am for a cuppa tea and chocolate cake in support of Parkinson’s Awareness Week (18th-24th April) to raise money for parkinsons.org.uk, a wonderful charity very close to me. 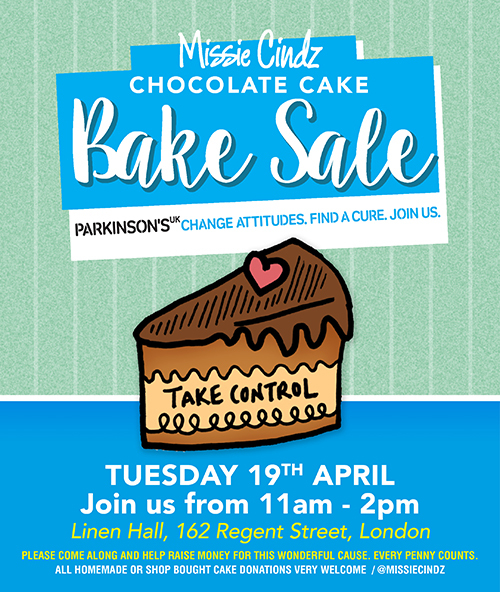 In my books, there’s no sweeter way to fun(d)raise than having a Chocolate Cake Bake Sale: helping to spread awareness of Parkinson’s one slice at a time, the perfect chance to catch up over a cuppa and a slice of something delicious for a great cause! Whether it’s a homemade indulgent chocolate fudge cake, Artisan Mud Cake or even a delicious shop-bought treat, nothing beats sharing a slice of something good with workmates and friends. All I ask from guests is to make a donation for the cake and coffee/tea served on the day. If you would like to make or donate a cake to the Bake Sale, feel free to email me here – I’d be really happy and this would mean a lot! Hope to see you there, let’s stuff our faces on chocolate cake, slurp tea, laugh plenty and raise loads of cash for a wonderful cause. Every slice (penny) counts! – see you there!